Never judge a book by its cover? However, the captured text on the front cover clearly reads "A Tragedy In Steel" and nothing could be further correct as well as direct to the point. You'll be crying, hurling, and shouting at the arrangements, compositions, excellent vocals (no? ), and not to mention radical titles such as 'Dowerless Daughter'. 'Thankless Child'. 'Stand Up For Bastards'. etc. It's... like... if... the... braindead children of Frankenstein's Monster and Bride decided to put on a metal show set in Shakespeare's drama. Oh c'mon, it surely can't be that bad? It's just the old eighties Power Metal with a singer that clearly enjoy to show off his brilliant impression of Boris Karloff on fire while in character as Frankenstein's Monster? No? Well... strange... because that's what the lead vocals will remind you of the most... Boris Karloff on fire!!! Expect no resurrection, nor the mighty power of lightning as they stuggle to find a single dry match in this dark cornor of metal. 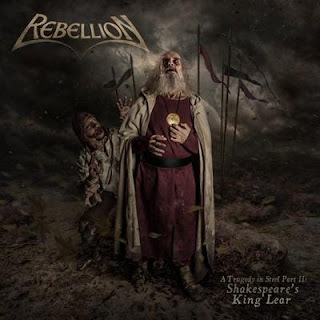 The Rebellion's new album is characterized by its dark and gloomy atmosphere, weak arrangements and ludicrous vocals. Sadly on this release, the Rebellion's ideas are still more work-in-progress and let's head back to the drawing board. At least Shakespeare must be greatful that he's long gone and six feet under ground... or never truly excisted at all in the first Place?. But seriously... picture it... Boris Karloff on fire!!! Oh the horror, the horror.